Large Arm and Bed Space 9" x 5"
Quilting and Home Decor - It's the first Janome with the AcuFeed: layered Fabric Feeding System. 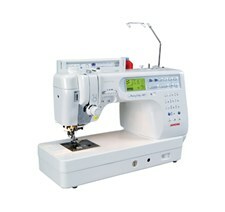 It has the speed and professional features to take you to the next level of sewing. Arm and bed space 9" x 5"